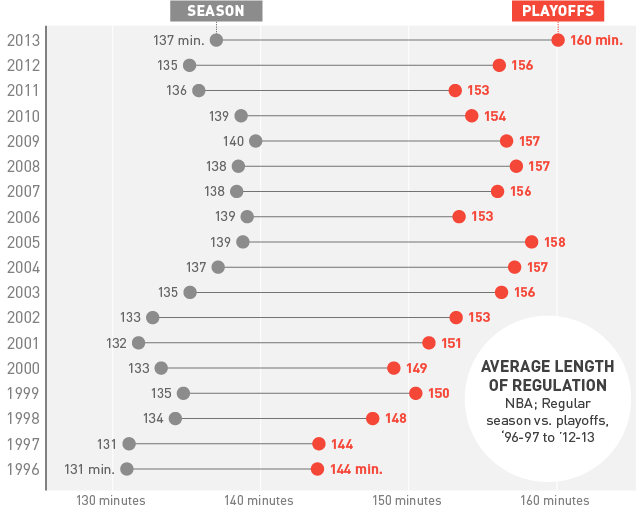 Home / NBA / Visualization / Guest Post at Deadspin: Why do NBA Playoff Games Take So Long? I have a guest post up at Regressing (Deadspin's stat geek subsection): Why Do NBA Playoff Games Take So Long? This builds upon my previous work on the length of NBA games, focusing now on what adds to game length in the NBA in general, as well as what drives the increased game time in the playoffs. I would love to take the credit for the amazing visuals in that post, but those are the work of Reuben Fischer-Baum.